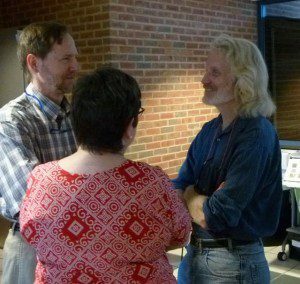 Sam Droege talks with audience before his presentation. Sam Droege, USGS Patuxent Wildlife Research Center Biologist, and a bee expert who has studied native bees all around the world, gave a presentation on specialist bees and the plants that support them at the Arlington Library on May 11, 2015. The talk was sponsored jointly by the VNPS Potowmack Chapter, and the Arlington Regional Master Naturalists. Rising awareness of the important role of native bees along with a recent focus on the subject by media, both social and mainstream, made this a popular event. Droege introduced his topic with a reminder about the cost of species loss; the loss of future discoveries and benefits that will be forever unknown. There is a great deal we do not know about insects as a whole, he said, and if the plants are not there, the pollinators will not be there. If we save the plants, we’ll save the bees and the other insects too. Plant diversity equals bee diversity. “It’s up to us to unmess the mess,” said Droege; the one we have created with habitat destruction. Droege explained that native bees are divided into two types, generalists, which make up about 80% of the total population, and specialist bees, which make up about 20%. Some specialist bees feed from only one kind of plant, and some on two, or at most three kinds, and these are all ‘rich diet’ plants. The specialists do badly on the same diet that generalists can survive on. Generalists can even sustain themselves on many plants we consider weeds. Their population numbers are higher, they have numerous or continuous broods. They also can handle disturbed sites. On the other hand, specialist bees, because they are exploiting a smaller genus of plants, have lower population numbers. They are also around a shorter time, only while their plants are blooming, which means only one brood. They are usually present in a noticeable way for only five weeks, said Sam, and then, “They’re out of there,” spending the rest of their lives underground. The presence of specialist bees indicates quality habitat. 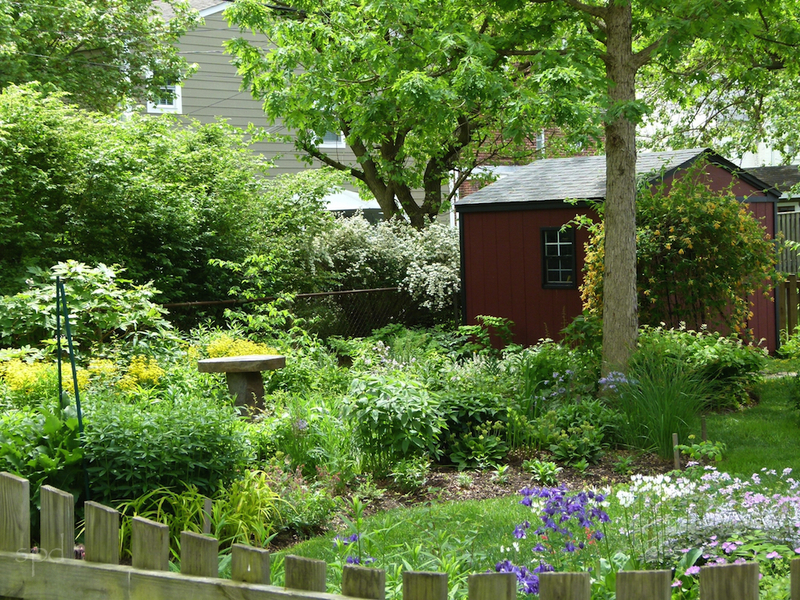 As we think about which plants to choose for use at home, or in community plantings, Sam urged the audience to consider their yards as a refuge. “Your yard is like Yellowstone to a bee!” Be a good refuge manager, he said, plant it and they will come. He pointed out that the generalist bees will benefit from the whatever we provide for the specialist bees and all the other pollinators will too. “Your yard is like Yellowstone to a bee!” Home of Susan and Jim Graham, on the VNPS garden tour this spring. Many specialist bees are found using the spring ephemerals in our vernal woodlands. Spring beauty, (Claytonia virginica), with its pink pollen, is the plant needed by the Andrena erigeniae bee. The invasive plant, lesser celandine, (Ficaria verna), which also loves the moist woodlands, is taking over in many places, crowding out spring beauty. Specialist bees cannot make the switch to feed on lesser celandine as European bees can. Native bittercress, trout lily, and violets all have their own specialist bees; and Andrena are not the only species that use the spring ephemerals. Trees and shrubs important to specialist bees include Willow, (Salix), with eight species of specialists; redbud, (Cercis candensis); dogwoods, (Cornus, especially the osiers and silky); and winterberry, (Ilex verticillata). Flowers in the Solidago, Symphyotrichum, and Helianthus families were among the most frequently recorded as being used by various specialist bees. Droege noted that the Solidago, or goldenrod, species is honored in Europe, where they are frequently incorporated into landscape plantings. Bees are attracted to color, said Droege, and flowers are a spectacular part of the environment. Bees are not born knowing where to look for food, they have to search. In order to help bees find your ‘refuge’ and to provide enough food when they arrive, Droege recommended planting flowers in clumps. Many members of the genus Vaccinium , which includes blueberries, are used by specialist bees. 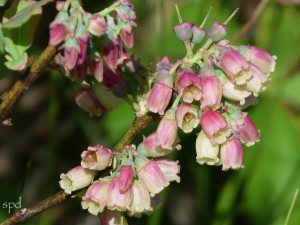 Many plants in the Ericaceae, or heath, family, especially in the genus Vaccinium, such as blueberry, (with 12 native spp. ), deerberry, (Vaccinium stamineum), and cranberry, (Vaccinium macrocarpon), are also used by specialized bees. The deerberry is the sole source of food for one of the specialists. These natives are all ‘buzz’ pollinated; the pollen is loosened by rapid wing vibration. Honey bees are poor pollinators of these plants, they have to disarticulate their wings to actually shake the pollen loose. “Native bees do the Buzz!,” said Droege, thus make superior pollinators. Droege had many more examples of unique adaptations between specialist bees and plants such as evening primrose, (Oenethera spp. ), dwarf dandelion, (Krigia virginiana), and pickerel weed, (Pontederia cordata). A specialist bee, for instance, has developed reduced hairs in order to collect the unusually formed pollen of the Oenethera. In closing, Droege mentioned in passing just a few more of the plants he would like to see more widely planted. These are plants mainly overlooked, yet good choices for homeowners, and especially beneficial to the specialist bees. These were: staggerbush, (Lyonia mariana), maleberry, (Lyonia ligustrina), and frost aster, (Symphyotrichum pilosum). And also: “Bare dirt!” he exclaimed. Most of the native bees are ground nesters, and they need bare dirt for raising their young. Pussytoes, (Antennaria spp.) and bluets, (Houstonia spp.) also make light cover bees can use. Droege and Jarrod Fowler, Stockbridge School of Agriculture, University of Massachusetts, Amherst, MA, USA , have recently published the results of their joint survey, “Specialist Bees of the Mid-Atlantic and Northeastern United States.” Of the thirteen states included in the survey, the ones most inhabited by specialist bees are New Jersey, Maryland, and Virginia. This certainly gives us a special mandate to support these bees, and the plants they need, which, of course, are also the plant’s most efficient pollinators. Just to thank you for this valuable info and photos. Nancy, we suggest that you contact Sam directly with your question, his email is given at the end of the blog post.Thanks for your interest! Very interesting subject, and one which should receive more support. Too little is known by even naturalists like myself about bative bees. Very inciteful article. Thank you. Continue your important interpretation of this topic.